I am not a KS1 expert, but was assisted by one in writing this. It appears that new tests will be published each year from now on. There will be two tests, each with a recommended duration of approximately 30 minutes (not strictly timed). The first will be a combined reading and answer paper, which will be part-read to children. The second will be completed independently and will be of higher challenge. Between 60% and 90% of marks will be awarded for comprehension, with up to 30% awarded for inference, and up to 10% awarded for understanding ‘language for effect’. The final total score (out of 40) will be converted to a scaled score, with an indicator of whether or not the child has met the expected requirements. As with KS2, there will be a separate arithmetic paper which tests calculation skills out of context. This will contain 15 one-mark questions. A second paper, worth 35 marks, will test fluency, reasoning and problem-solving. This is expected to last around 35 minutes, and can be taken with a break. In line with requirements at KS2, all children in KS1 will be required to take a Grammar and Punctuation test, as well as a Spelling test. The Grammar and Punctuation assessment will consist of two parts. The first will be a short writing task based on a prompt, which can be assessed for various features including handwriting. This task is expected to take around 20 minutes. The second will be a test requiring short answers, focussing on grammar, punctuation and vocabulary. This test will be taken in two parts, lasting approximately 10 minutes each with an optional break between. Finally, there will be a Spelling test of 20 words, which will take approximately 15 minutes. Following its release of consultation outcomes last week, the DfE has now released its test specifications for the new National Curriculum tests. I don’t know enough about current KS1 tests to make comparisons, so hopefully someone else will, but here follows an outline of the proposals for the new Key Stage 2 tests from Summer 2016. The changes already made for the 2014 series will be maintained, i.e. the test will last for one hour, to include reading time, and will consist of a selection of fiction, non-fiction and poetry tests, with an accompanying answer booklet. Questions will be roughly in order of difficulty. The paper will be scored out of 50, as currently, with final raw scores being converted into a scaled score, with 100 representing the expected standard. There will be no extension paper. 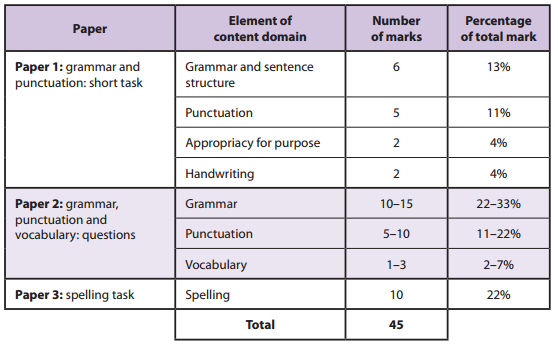 The structure of the papers will be broadly similar to those currently used: One paper of 45-minute duration will assess punctuation and grammar (50 marks) through short answer questions, while a second test will assess Spelling (20 marks). The spelling test will be read to students, with each spelling contained in a separate sentence as has been the case since 2013. As with Reading, overall marks out of 70 will be converted to a scaled score, with 100 representing the expected standard. The most notable change to the tests is in the mathematics papers. The former mental mathematics test is to be replaced by a 30-minute arithmetic test. This will consist largely of one-mark questions using context-free calculations. There will be some 2-mark questions for long multiplication and long division calculations. In two-mark questions, it will only be possible to obtain single mark for a wrong answer derived from a correct method when using the intended standard method. There will be a further two test papers, each lasting 40 minutes and containing 40 marks. These will test fluency, reasoning and problem solving, in a manner similar to the current tests. Up to half of the questions will be provided within a context. There will be no calculator paper, and no extension paper. As with other tests, raw scores will be converted to a scaled score, with 100 representing the expected standard. There will continue to be Science testing for a sample of pupils. These will consist of three 25-minute tests, with each addressing either biology, chemistry or physics. A new baseline assessment will be introduced from September 2015 likely becoming compulsory from 2016. There is no real detail about what this will entail, other than that it will take place in the first few weeks of the reception year. From September 2016, therefore, there will be no requirement to complete an EYFS profile for children. The EYFS framework will remain statutory. Schools have now been invited to sign up for a baseline test to use this year, and we expect to find out in the summer term which of the suppliers have gathered enough uptake to go ahead in September. There is no change proposed to the phonics check. Judgements will continue to be made using teacher assessment. However, these are expected to be supported by results of externally-set (but internally-marked) tests in some areas. Scaled scores will be provided, with 100 being the expected outcome for the age group. There is no indication in the documentation about which, if any, of these results will have to be shared with parents. Presumably this will mean the current system will remain whereby scores don’t have to be reported, but must be shared if parents request them. No further assessments will be nationally prescribed. Both teacher assessment and external testing will be used following a similar model to the current framework. There is very little detail in the consultation about higher ability groups. 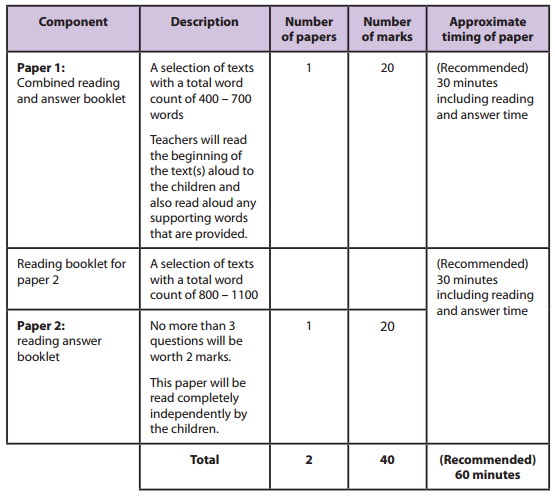 Previous comments have suggested that only one set of tests will be used in KS2, with no extension (level 6) papers. This has now been confirmed. The only mention in the DfE releases is that schools will be required to publish “the percentage of pupils who achieve a high score in all areas at the end of key stage 2”. “High score” has not yet been defined. It appears that there will be no indication in Teacher Assessment of how close students were to meeting the required standard. The scaled score will provide some indication of these. Children working significantly below average levels (i.e. with specific SEN) will continue to be assessed using P-levels. When draft performance descriptors were published, it appeared that there was a notable gap between the top of the P-scales and the lowest possible category of grade descriptor. These have since been withdrawn and will be replaced in the autumn in some form. This is a massive leap. However, it is potentially softened by the second standard about progression. Unfortunately, in typical DfE style, the progression measure of “sufficient progress” will be based on the average progression – another case of all schools needing to be better than average? Perhaps. The detail is too vague to be sure at the moment, but we do know that the department will decide what constitutes “sufficient progress” after the KS2 tests have been taken and marked. For further commentary & opinion, see my previous blog on the changes. It’s always amazing how one department can have such contrasting views on matters. Days after the primary assessment & accountability consultation closed – all the way back in October – Michael Gove was making comparisons between rising GCSE outcomes and Soviet economics ministers massaging the figures. He spoke about ministers “lying” to children about increases in grades awarded. With “comparable outcomes” rules, the department made clear that standards are not expected to rise at all at GCSE level except in exceptional circumstances. Today, his department has finally released the outcomes of the primary consultation and by the third page it includes the bold claim that for primary schools the reverse is apparently true: “With the continued improvement in teaching and the sharper focus of the new curriculum, results should rise.” So that’s simple. What’s more, the rise is not intended to be gradual. In 2014, the attainment floor threshold for primary schools is set at 65% of children achieving Level 4c or higher. In two years time, schools will be expected to have 85% of children attaining the new higher threshold – something around the current 4b level. Only 63% of children did so in 2013. A cynic might suggest that the policy opens the door for a mass wave of forced academisation in the primary sector – something that the DfE seems to have struggled to encourage through its carrot-based approaches: the stick looms! The rationale for this stark change? Not enough children who currently achieve a 4c at Key Stage 2 are getting 5 good GCSEs. It isn’t made clear quite why this is primary schools’ fault, but evidently that is the conclusion the department has drawn. So standards cannot rise at secondary school, but must at primaries. How will this rise in standards be judged? In KS1 it seems that level descriptors have been scrapped with much fanfare to make way for… performance descriptors. Quite how these will be different remains to be seen. At KS2, teacher assessment will be based on a set of threshold descriptors for Reading, Maths and Science, which like the tests in Reading and Maths will show either that a child has – or has not – met the required standard. A standardised score from tests will give some indication of quite how far they have exceeded (or missed) such a target. The department proudly asserts that the new scaled score will offer increased precision of results at KS2 – scientists will note that they make no claim about accuracy! Externally-set tests are back on the menu for KS1 – although without the benefit of being able to pack off the papers for someone else to mark. Standards will rise all around – as if by magic. Or else. Progress will form part of the new accountability framework, but with little indication of how it will be measured. As a middle school teacher, I notice no effort has been made to correct the nonsense that some middle schools are judged on the KS2 progress of children who might have been with them for just 2 terms out of their 12-term middle school journey! Finally, it’s interesting to note that P-levels are to be retained. One can’t help but think that after 5 months of wrangling to try to make something work in keeping with their proposals, the DfE felt that tackling P-levels too was a bridge too far. But that might just be cynical. I have summarised the details of changes for primary teachers at this blog post. Schools up and down the country are faced with the task of finding a replacement assessment tool to monitor progress and attainment as National Curriculum levels become obsolete. Doubtless there will be plenty of private products on the market, and many organisations willing to charge schools for software, booklets, hardware, coloured highlighters… the works! This blog attempts to outline some of the questions leaders should be asking about any scheme they consider adopting before buying in. This is not a case of trying to find a best-fit. If a scheme is going to be worth investing both money and time in, then it needs to meet all of these criteria. 1. Can it be shared with students? All manner of systems is likely to become available, but I think that the first question any school should ask of any product is whether or not what is recorded in the assessment system can be meaningfully shared with the students. For example, a spreadsheet which simply records a percentage of coverage, or a scaled score will not provide meaningful information that can be used with students to set next-step targets, or to record the detail of progress made so far. We know so much now of the importance of feedback, not least the fact that a simple number or grade won’t cut it. A meaningful assessment system needs to record exactly what students can and can’t do, and then make clear where energies need to be focussed next. 2. Is it manageable and useful for teachers? One of my greatest concerns about APP is that it created unnecessary work. The detailed processes of highlighting, ticking boxes, working through a flow-chart and then moderating, all to agree that the child I thought was working at Level 4 is indeed working at level 4 was unhelpful. The only useful aspect was being able to see where gaps were that could next be taught or targeted. But the system was over-complicated. For example, within level 4 there were 3 or 4 statements which essentially boiled down to the idea of beginning to use paragraphs. Once a child could have one statement highlighted, it was quite likely that the others followed. Teachers value documentation which supports progression, but they don’t need to highlight every tiny step – they become experts in this because it is what they do day in, day out. Any assessment system needs to build on the benefits of APP – by identifying next steps, and judging progress against key areas – without adding a burden of endless paperwork or electronic clicking. 3. Will it identify where students are falling behind soon enough? Much of what schools are about now is identifying those students who are struggling to make progress and intervening to ensure that they do. Consequently, an assessment system needs to record meaningful information (note, not data) about how students are progressing through required learning, and be able to highlight those students who are at risk of faltering. The current system fails on this count. NC levels were too broad to be able to identify students who were not making progress, but sub-levels did not link closely enough to the content. Consequently, it was perfectly possible for a Year 6 student to achieve level 4 or even level 5 in mathematics, without knowing his multiplication tables. The weighting of strands was insufficiently detailed to allow meaningful identification of strugglers, or often left it too late. Any replacement system should have clear flags which highlight where students are struggling to keep up with age-related expectations. Thus, if Y4 is now the stage at which students are expected to know their tables, then any child failing to meet that goal by the summer term of Y4 should be easily identified, and then supported to do so. 4. Will it help shape curriculum and teaching? Another failing of the levels system was in their breadth. That was originally an advantage, but over time it failed to support teachers in adapting and developing their curriculum to meet the needs of students because it provided inadequate information about what children could and could not do. The new curriculum makes explicit what should be covered – particularly in primary core subjects – and so a good assessment system should build on that to help teachers identify where they need to focus their attention. 5. Will it provide information that can be shared with parents? Despite what central government has claimed, parents have largely come to understand the broad system of levels, and usually find it easy to understand the measures in reports and parents consultations. However, they have never given anything more than a broad indication of attainment. They don’t provide parents with clear information about relative attainment, nor about what action can be taken by students, schools or parents to move their children on. In many cases teachers have begun to do this, but a good assessment system needs to provide a meaningful measure that can be shared with parents (which could be as simple as a percentage of annual objectives achieved) as well as meaningful information about what needs to happen next. There is much overlap with question 1 here, and a system which provides information well for students will usually be successful in informing parents. 6. Will it help to track progress across the key stage? Tracking is not the same as assessment. However, tracking progress is essential in schools now, and so any assessment system must allow schools to identify how its students are progressing towards national expectations for the end of the key stage. This is particularly challenging at the moment in primary schools where the expectations of end-of-key-stage assessment have not yet been made clear. However, through some collation of recorded information in an assessment scheme, it ought to be possible to create some sort of data-based indication of progress across the cohort, as well as for specific groups. If a system is built around indicating whether annual objectives have been met (or perhaps even partly met), then it would be possible to draw an overall average either of what percentage of all objectives have been covered, or of students who have, say, met 80% or more of the objectives for the year. Such data could be analysed by groups, gender, etc. as we currently do with sub-levels, but where there are issues with progress of certain groups it ought to be possible to return to the original objective information to identify how best to intervene with such groups. 7. Does it avoid making meaningless sub-divisions? It strikes me that this should largely be a yes/no decision. Either a child can or cannot describe that movement. You could argue that there are students who are beginning to but perhaps have small gaps in their knowledge – say, knowing that it orbits the Earth, but not knowing the length of the cycle. Accordingly, it might be reasonable to say that a child has either partly-met or fully-met the objective. To attempt to divide it into smaller categories (beginning? mostly?) becomes meaningless and adds nothing to the system but complexity. Any viable system must avoid this temptation. You’ll notice that I’ve not mentioned anything about Ofsted. My view is that if a school system can meet these needs, then it cannot fail to demonstrate to Ofsted how assessment is supporting teaching & learning and there by supporting progress. That, after all, is what we’re about in schools. The DfE has now produced its own attempt at a checklist for effective assessment systems. It’s disappointing, but worth mentioning. You can find it here (PDF). This post will undoubtedly open me to accusations of being a turncoat and other such things. It will probably change some people’s perception of me – in either direction – and may not make me wholly popular. However, 5 months ago I wrote here about why I was striking, and so it seems only sensible to now say why I am not. Indeed, why I am leaving my current union. Firstly, let me emphasise my view that unions are generally a positive thing in the workplace, and that they should by-and-large be encouraged. Let me also say that my general view is that when your union calls a strike or other action, then unless there are exceptional circumstances, you ought to take part in that action. For that reason, I must stand by what I believe and in choosing not to strike, I am also choosing to hand back my membership card. In fact, on this occasion because of a school visit I had a legitimate reason for not taking part in the strike and could have done so without making my views clear; my conscience doesn’t allow that. In October I supported the strike action – and wrote about it – not because of a need to protect my pay, but because of the attempted erosion of working conditions for teachers. I consider workload to be one of the most pressing concerns for the profession, and the threat of the removal of a right to PPA or lunch breaks was unacceptable to me. The matter of changes to pay and pensions concerns me, naturally, but in times of ‘austerity’, it was the unnecessary challenge to our conditions that raised my ire. That threat has now dissipated. The STRB was clear in its rejection of such an erosion of terms, and while I would be happy to take action in the future should such a proposal rear its head again, I do not see that as part of the current campaign. Which rather raises the question of what is the focus of the current campaign. My view of industrial action is that it should be targeted. We cannot use withdrawal of labour simply to express our dissatisfaction with political decisions. There are ways and means to achieve that. If we do not agree with the current political agenda, then we have an opportunity to vote at the next election, and perhaps even a responsibility to support the efforts of those with whom we do agree in getting elected. I am happy to continue to pay my membership fee as a member of the Labour party because I would prefer to see a Labour government than the current one. But that is not directly related to my professional capacity. If action is to be targeted, then there should be a clear indication of what action the employer can take to prevent such action. In this case I do not believe that clarity exists. The NUT claims that the strike is over the combined matters of workload, pay and pensions. On these three arguments they have plenty of reasons why they think things are not good enough, but I see little evidence of what they propose be done to improve things. I agree with them that Performance Related Pay is unlikely to achieve much. But I don’t see evidence of the damage it’s claimed to cause. I agree with them that working to 68 seems a challenge for many teachers. But I don’t see why teachers are different from shopworkers. I agree with them that teachers’ workloads have increased. But I don’t blame central government for that, and cannot see what exactly they expect the Secretary of State to do about it. The only area where I wholly agree with the NUT stance is on the unfair changes to the pension scheme which have been poorly-evidenced and strike me as an effort to raise treasury funds other than through taxation. If that had been the only issue since we were first balloted in 2011, then perhaps this campaign could have been more focussed? Perhaps action could have been more concerted in the early months rather than drawn out over 3 years. Perhaps a series of well-organised, carefully-managed and well-supported strikes or interventions may have made the message clear. However, what has followed has been the on-going whine of union leaders, with gradually decreasing willingness from those on the ground. For a strike to be successful, it needs the support of those not directly involved. Occasional one-day strikes over a three-year period have not garnered additional public support, and given the length of the campaign has singly failed to raise understanding of what is sought. If after three years, members in my school are unclear of the focus of the campaign and action, then what hope for the wider public? I am disappointed to have reached this point. I am frustrated that the ineffectiveness of the union action has allowed the Secretary of State to push through unreasonable changes against the will of the profession. But most importantly, I am no longer prepared to encourage others to take action over matters which are neither fully explained or justified. What is more, I think a ballot now of classroom teachers would yield a very different result to that of 2011 or 2012. It is not that teachers support the government’s moves – let no-one read that into my words – but that they are tired of the long campaign that lacks direction and purpose. We have been let down. I love the theory of themed chats on Twitter, but I’m hopeless at the practice of them. I never remember when they are, I’m often not available, I still haven’t mastered using Tweetdeck without getting very frustrated by the pace, and often find too much noise and not enough coherence. And of course, I usually feel I have too much to say, as is my way. But I know they’re very fruitful for others, so I genuinely hope that the #primedchat on Wednesday evenings (makes mental note) continues to thrive. I will try to contribute during, but I’ve also decided to put down some thoughts here in advance on the theme of How do you make assessment useful without it taking over your life? Assessment is such an important part of the job that we do, but I do fear that too often we end up prioritising assessment for assessment’s sake, or for other reasons, rather than focussing on the key purpose of assessment: improving learning. My main bugbear in this respect is the dreaded needed for tracking. Tracking is really important, and vital for schools if they are to be able to ensure that students make good progress over longer periods of time. However, tracking is of very little use to me as a class teacher. I have no interest in whether Abigail is now a 3a or a 4c in Writing. What matters to me is exactly what she can and can’t do – and those numbers don’t tell me that! I’ve written more about getting this balance right here: Tracking ≠ Assessment. What is useful to me as a classroom teacher is a knowledge of what children in my class can do, and what they need to do next. In some respects – and I say this with many caveats, only a fraction of which I’ll discuss here – the APP materials were useful. The breakdown of progression in Reading and Writing particularly was made quite explicit by those materials, and in lots of cases my knowledge of that content has helped to improve my teaching. Indeed, I’d go as far as to say that until I became familiar with the content of AFs 4-7 on the Reading APP grid, I was probably a pretty poor teacher of reading. But I still don’t find it useful as an assessment tool. The idea that somehow quality of writing, or capability in reading can be simplified to a process of highlighting statements and then working through a flowchart to allocate a number strikes me as laughable. In most schools I have seen, the experience of APP is a means to an end: a way of turning a teacher’s knowledge of his/her students into a computable number. Let me be clear, then: APP is not a solution. Staff discussions about whether an individual child has “sustained an awareness of the reader” in his writing, or what the difference is between “basic features of organisation” and “various features of organisation” are not helpful for teaching and learning. The attempt to break down very complex processes into a measurable number of small steps has not worked. It may have allowed us to claim a sense of accuracy when deciding whether to stick a 3b or 3a label into a spreadsheet, but that is an illusion. And it doesn’t move learning on. So if not that, then what? I have said before, and will argue again that we need to separate the processes of teacher-led assessment from larger scale tracking and reporting. That’s not to say that the former won’t feed into the latter; but it is important that the tracking/reporting need doesn’t drive the assessment. Some children need to focus on skills, or be taught things, which do not appear on an APP grid. They might be steps that do not affect their ‘level’, but which are essential to their ability to move on. Maths is a classic example: The Level 4 APP statement that children need to know their tables up to 10×10 is of no use to the child who needs a target to learn their 5x table. The steps pretend to be small and manageable, but the reality is otherwise. We need to be realistic about this. We need to admit that assessable steps are necessarily larger than the tiny incremental changes that happen in classrooms. The tiny steps are the grit of daily teaching, but to attempt to make such tiny measures into a recordable and reportable system is an error. We need to be realistic about what can be achieved at each level. A school has a responsibility to move its children from the expected level on entry to Year 1 to the expected level on exit at Year 6. Within that, you might reasonably set key marker points at which judgements can be made against progress towards those goals. The original levels statements were intended to do this. The new year-based National Curriculum allows us to do something similar. It might be reasonable to judge whether a child has met a majority of the expected intended learning targets for a given year. Anything smaller than that will depend on the structuring of the curriculum. If I hammer the teaching of speech marks in term one of Y3 then it would perfectly reasonable to expect most children to be able to use them by Christmas. If I choose to leave it until summer then the outcomes will be different – but doubtless children will have learned something else in the meantime. The sequence is not – indeed cannot – be fixed. At the national level, it’s perfectly reasonable for the central government to set expectations. Indeed, even at school level, schools may happily adopt the yearly expectations of the new programmes of study – at least for maths and science. But below this level, schools must drive both planning and assessment in tandem. At the medium term level, it makes sense to me that schools devise their own medium-term plans and that the assessment outcomes are explicit at that stage. Many (most?) schools plan half-termly units of work, and it seems to me that this is sufficiently long a period of time to also set some expected outcomes. Teachers can devise a plan with some key expected outcomes and use these to assess progress at the end of the unit. It is assessment like that that can be shared with parents – a clear-to-see map of what a child can and cannot do. It is assessment like that that can help teachers to track children’s progress towards expected outcomes at the end of the key stage, and more importantly to highlight at a relatively early stage those who are at risk of falling behind expectations. The short-term level is probably the most important both for teaching and assessment. A teacher who is clear about expected outcomes for the term and the year can plan appropriate lessons, and more importantly set appropriate short-term targets for the children that he/she knows well. The targets can be meaningful for individual children, easily monitored as part of the unit’s work (particularly if schools adopt a mastery type approach) and significantly can focus on the small steps needed for the children in that class. Significantly, though, these short-term plans and assessment outcomes are unlikely to be useful for tracking. There is no sense in attempting to record every detail of them, any more than there is in insisting on individual lesson plans for every lesson. As lots of schools start to prepare for the introduction of the new curriculum, the re-drafts and rushed implementation have left some questions. This post attempts to answer some of the most frequently-asked. If your question isn’t answered here, then Twitter is always a good place to ask! When do you have to start teaching the new curriculum? The curriculum becomes statutory from September 2014 for all primary year groups except for the core subjects in Years 2 and 6. In Years 2 and 6 the old (1999) curriculum remains statutory for one more year to allow for assessment using the current style of KS2 tests in the Summer of 2016. Does everything need to change? The whole of the National Curriculum will be replaced from September 2014. However, this doesn’t automatically mean that all plans need changing. PSHE and Citizenship lessons are not statutory, and so are not affected. Similarly, RE falls outside the scope of the National Curriculum, so schools should continue to use plans matched to the locally-agreed syllabus. Is there any scheme like the National Strategies to support schools? The government has been clear that it does not intend to roll out a national support scheme. However, some curriculum organisations have taken a lead on providing resources for the new curriculum to support schools. The DfE also suggests that schools liaise with a nearby Teaching School Alliance. The www.primarycurriculum.me.uk website contains a page with links to subject organisations that provide support for the new curriculum. Do teachers have to follow the year-by-year programmes of study? Many sections of the new primary curriculum are set out by year group, or paired year groups. However, the statutory basis of the National Curriculum (under the Education Act 2002 and subsequent legislation) does not permit the government to specify curriculum content other than by key stage. Therefore, the new curriculum allows schools to move content around within each key stage. Thus any content set out by year group can be considered ‘advisory’ sequencing. What about mixed age classes? How much time should each subject be taught for? No amount of time is specified in the curriculum or its accompanying guidance. The legislation does not permit the Secretary of State to make such specifications. It is for schools to decide what time should be given to each subject, or how it should be organised. Schools can continue to use cross-curricular teaching, so long as they cover the Programmes of Study specified for each key stage. What will KS2 National Curriculum tests be like in 2014 and 2015? There have been some changes to National Curriculum tests at KS2 for 2014. This includes a change to the structure of the Reading Paper, and the change to the combination of papers for Mathematics. The Reading paper will no longer follow a theme, but will have three separate texts of increasing difficulty to be tackled in order. In mathematics, there will no longer be a calculator paper, although there will continue to be two papers. There is more detail about all the KS2 tests on the DfE website. Tests in 2015 will be broadly similar to those in 2014, based on the 1999 National Curriculum. Will children have to sit a calculator paper, just without a calculator? Despite much confusion around this area, the DfE appeared to confirm earlier this year that the new test papers for 2014 have been written since the decision was made to remove the calculator paper. Therefore, children will not be faced with questions intended for calculator use. @michaelt1979 Questions were appropriately developed for the new non-calculator context. 2014 maths test was constructed in Oct 2013. 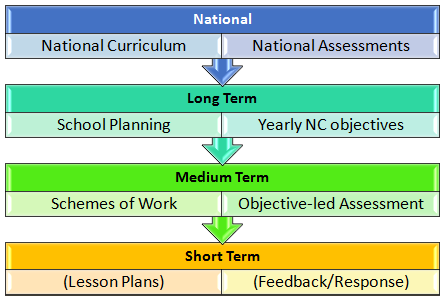 As since the National Curriculum was introduced, levels have only been part of statutory assessment at the end of each key stage. This will continue until the summer of 2015, when KS1 and KS2 results will be recorded using levels for the final time. There is no requirement to use National Curriculum levels to assess in any other year group or at any other time. Under the new rules, schools are free to choose their own approaches to assessment for the curriculum, although a new system of outcomes will be in place for Y2/Y6 from Summer 2016. What will replace levels at the end of the Key Stage? The government consulted on assessment and accountability for primary schools in the autumn of 2013. This included proposals for assessment in Early Years, and a system of scaled scores at the end of KS2, with a possibility of ranking students in deciles. The results are of the consultation are expected in the spring of 2014. Until these are known, we cannot be certain of the new assessment processes. 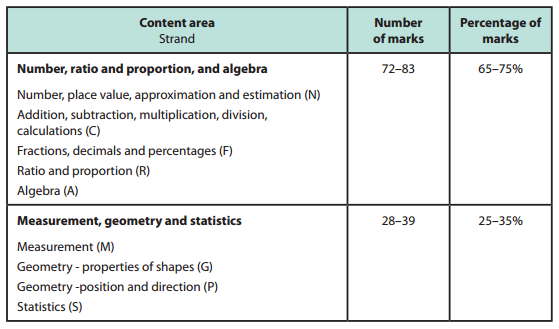 For primary schools, the expectation is that existing test areas are likely to remain unchanged (i.e. tests for Reading, SPAG and Maths, teacher-led assessment for Composition, sampling for Science) although these have not yet been confirmed. There has been much discussion of the major changes in the Computing (ICT) curriculum. However, many of these changes are less significant than first appears. One teachers are familiar with the language of the Programme of Study they will come to recognise familiar content from the curriculum. For example, an algorithm is simply a sequence of instructions for carrying out a particularly task, such as programming a simple Roamer or Beebot device. There is some excellent advice and support available on understanding the new Computing curriculum from various subject associations. Must we teach History in chronological order? The draft proposals for the National Curriculum originally indicated that history must be taught chronologically. This requirement was relaxed in the final version. Primary Schools must now cover history up to 1066, but it is for schools to decide how this is organised. The Programme of Study states that children should “continue to develop a chronologically secure knowledge and understanding of British, local and world history” during Key Stage 2. London is a long way from the Sussex coast*. Especially by train. And believe me, the peace and quiet of Sussex countryside has nothing on the silence of a London tube station lift! But these facts aside, I ventured up to @hgaldinoshea‘s excellent Pedagoo London event to offer my two’penneth on the new National Curriculum. I was also hugely relieved to find that others had made similar journeys in an effort to come and listen! I won’t blog about the whole thing in detail, as much of what I said can be better illustrated by other posts, but I thought I’d throw up a few words. The PowerPoint from the presentation is at the end of the blog if you’re particularly interested. 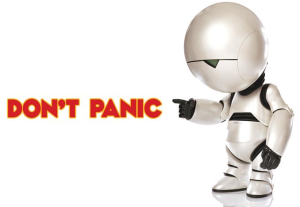 The broad message is: don’t panic! Many of the foundation subjects are now so brief in the new National Curriculum that anything schools are doing at the moment can probably continue. The main changes I suggest schools need to tackle are the higher expectations and the matter of progression in English grammar, and fractions in mathematics. I also mentioned the use of the Singapore Bar Model for teaching of fractions. If you’re not familiar with the model then I strongly recommend looking it up – there are some great YouTube videos – or checking out the materials at www.thinkingblocks.com which show the use of bars model modelling. I have written recently about the importance of curriculum design, and my presentation today built on that. Traditionally, primary school planning has often been based around the topic web design, with a common theme at the centre, and links of various quality drawing in other subjects. What I propose is a change in emphasis from thematic links to skill-based links. The specific example shown in the presentation is that of a Victorians topic, where the writing activities throughout the unit are all linked by the theme of influencing the reader. The intention is that rather than children relating all their work to the key idea of “Victorians”, they are able to build up a cohesive understanding of a clear aspect of reading and writing. It makes it much easier to focus both teaching and assessment, and also secures a clear hook for children. Often when we want children to think back to previous learning we find ourselves referring to an incidental aspect: for example, we might say that we want children to think about the persuasive writing they did in the Tudors topic. The problem is that the Tudors is what the children remember, not the persuasion. Or worse, they see persuasive techniques taught in the Tudors topic as unique to the Tudor-themed pieces. By creating topic-led planning, we often think we are creating cohesive links and enabling children to develop learning through a spiral curriculum. We perceive a coherent whole, with each brick slotting into place to build the wall. But what is more likely to happen is that children focus on the commonality (i.e. the over-arching theme) rather than the progression in the learning. One of the challenges facing schools is how to tackle the removal of assessment levels. What I tried to convey in my presentation is the important revelation that actually teachers already know how to assess, levels or not! I highlighted the fact that the new National Curriculum is pretty explicit in its expected outcomes in some subjects, such as Maths and Geography. Where it is perhaps less clear is in English, where the programme of study is generally quite broad. I’ve never been a fan of APP, and certainly not of sub-levels, but I can see that people are familiar with them. However, I think that most experienced teachers can assess – even to the point of levelling – without the national criteria. Any half-decent Year 6 teacher can quickly identify the work of a Level 4 writer, with or without an APP grid. One task I set the attendees of my presentation was to quickly discuss what aspects they considered to be key in identifying writing at Level 4. Evidently it lacks some of the nuance of the APP grid, but it also removes some of the waffle, and demonstrates the key strands of what makes a secure writer in Year 6. If schools draw on the experience of their highly-trained and highly-qualified staff, then they can probably devise their own assessment tools that are far more teacher-friendly, pupil-friendly, and significantly parent-friendly too. 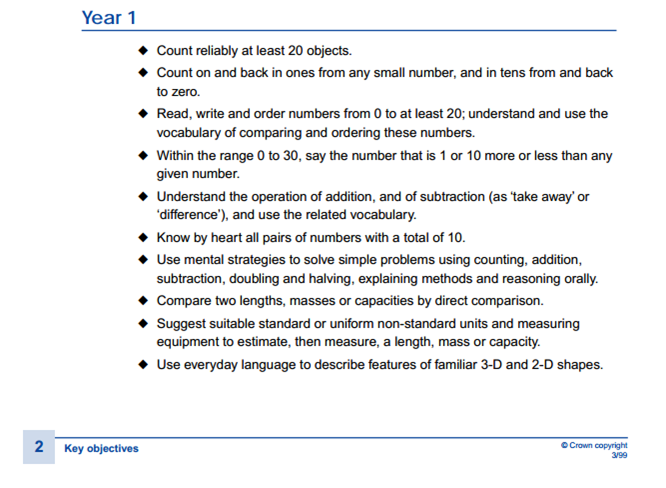 I happily draw anyone’s attention to the excellent materials from the 1999 Numeracy Framework for various reasons, including the exemplification pages, but on this occasion particularly to note the old Key Objectives. If we can devise something akin to these in our schools and localities, then I think we can manage assessment at the broad level far more usefully than by codes of numbers and letters, without over-burdening teachers with assessment of meaningless minutiae. Although, I appreciate, that’s a big IF! *This may not be literally or geographically true, but psychology counts for a lot! That’s a lot of Downs to get through.